Our first guest post! Annie, our Disney half-marathon runner, generously offered up this very honest look at something I think a lot of us struggle with: the fear of failure. Take a read and post how you feel about this! Who’s afraid of the big bad fail? Well, truth be told, I am. 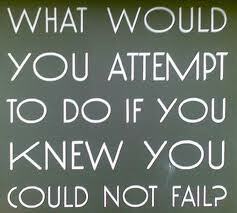 If someone else would ask me if they should be afraid of failing, I would give a big, unqualified NO! I’d say strive, try to set new goals, set new limits for yourself. But, the reality is, failure scares me big time. Which is maybe a bit surprising – overall, I’m a fairly confident person. Education: check. Successful career: check. Lucky in love, well, perhaps less so, but I have a wonderful kid. 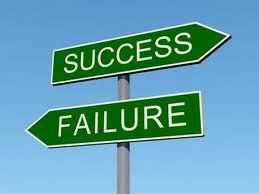 So when I talk about fear of failing, for myself I’m talking about setting running goals and falling short. I’m not an agile or lean person, and while I’m pretty capable, I have a tendency to run into problems (pun somewhat intended). I just completed my very first Half marathon in January of this year, which was a real personal best for me. It wasn’t easy, pretty or graceful, but I crossed that finish line upright and smiling. So then, what does fear mean, if I know (in theory) that I can run a distance, because at least I did it once? Well, in some cases, fear keeps me from trying. I get tired or cold or sore (as everyone does) and I look outside and I start to wonder why I should even go for that training run, when I know I can’t do it well anyways. Running is hard for me, rarely does it come easily or smoothly. I’m slow, and people pass me. I’m clumsy and huff and puff. I suppose running is tough for many people, and you just have to keep putting one foot in front of the other. That voice in my head is awfully persuasive, and keeps asking me just what the hell makes me think I can do it. You see, when I ran my Half, I had help – I literally had friends holding my hands and keeping me going. I’ve never been good at doing it on my own. I’ve done solo runs before (5k, 8k, 10k) but pushing myself to do longer distances includes pushing myself to do it solo. Why should that scare me? I am not sure, but for some reason, the voice that tells me that I can’t do it, shouts louder when there’s no one telling me otherwise. I shouldn’t need someone else to tag along to make sure I can do it. Why do I feel self-conscious? Really, what should I be more afraid of, not finishing or not starting? I don’t have answers for these questions for myself or for anyone else, but I guess the only thing I am focusing on right now is my mantra: “keep putting one foot in front of the other”. It’s a tough, uphill journey for me (and injury prone) but I am booking myself into more long runs this year. I am terribly, terribly afraid of those time limits, and wondering if I can make them. Yup, I’m afraid and I’m admitting it. In some cases, rather terrified. But, I’m doing it. I’m not stopping. I’m not letting fear stop me.